Many people who try to upgrade from Windows Vista to Windows 7, face some problems while installing Windows 7. When you try to upgrade from Vista by using the install method as “Upgrade”, the installation process of Windows 7 gets stuck at either 62% or 72%. The moment the setup process completes 62% or 72% of installation, it automatically stops or hangs. 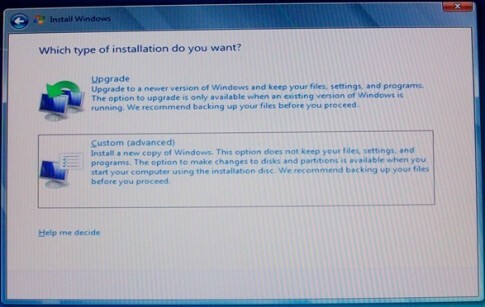 You need to remember that this installation error is encountered only while you try to upgrade from Vista to Windows 7. If the error shown during installation exactly matches with the above mentioned error, you can resolve the issue and carry on with the installation using a simple workaround. Follow the below mentioned steps to resolve the issue. First of all, you need to reboot your PC so that it rolls back to Vista Operating System. Now, click on Start button to display the Start Menu and right-click on “Computer”. Select the option “Properties” from the right-click context menu and then choose “Advanced Settings”. Click on “Environment Variables” and under System Variables section, click on “New”. Type the below mentioned variable information. Finally, reboot your PC and start the installation process of Windows 7 again. Once you have done this, the installation process won’t get struck anymore and you will be able to upgrade from Windows Vista to Windows 7 without facing too many problems.Please Comment!